That nearly half of the world’s young people are jobless is daunting. Worse still, what’s being done to tackle the problem isn’t working. A recent study found that only a third of over 100 youth employment programmes had a clear positive impact on employment outcomes and earnings – and even those with positive outcomes had limited impact. These programmes aim to increase employability, but have seldom led to higher employment. The large numbers of youth entering the market will need 600 million more jobs over the next 15 years. Simply more jobs won’t do either. One in four young people today can’t find work for more than $1.25 per day, and women lag behind men. Not only must new jobs be high-quality, they need to be more inclusive too. Overcoming this complex challenge requires a multifaceted and integrative approach – one that intervenes on the labour supply side, to help increase the employability of job-seekers, and focuses on the labour demand side, to help firms create more jobs. 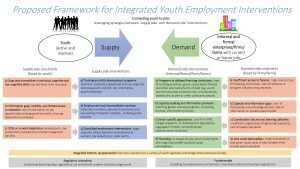 Such an approach is presented in the new integrated framework by Solutions for Youth Employment(S4YE). The coalition’s cutting-edge work has produced a fresh perspective on developing a second generation of integrated youth employment programs: this new integrated framework now needs to be piloted, tested, and measured. To promote the creation of youth-relevant jobs. To increase employability, youth employment programmes need systems that help gather data about the constraints beneficiaries face, and cater to those specific needs. Programme designers should identify the right target population, clearly define socio-economic or demographic groups, and profile the selected beneficiaries to grasp the intensity and diversity of the constraints each one faces. Integrated packages of services should then be developed based on these specific constraints. These integrated packages should be delivered using performance-based contracts with incentives for placing youth in jobs, including a premium on placing especially hard-to-place youth. Robust supply side interventions should be used with equally strong interventions on the demand side to boost youth-relevant jobs. Firstly, a profile of possible jobs should be formed to match the target youth population. The requirements of the target group of enterprises should be defined and supported in order of priority. The constraints to growth these enterprises face, as well as the barriers to entry for new enterprises, should be identified. Taking these requirements and constraints into consideration, a package of support services can be designed and implemented – once again with performance-based contracts wherever possible. Carefully customised supply and demand interventions should then be appropriately connected. Linking the two is crucial to maximizing their unique synergies from the project identification phase all the way through implementation. Effective integration also relies on specific elements of design. These include formulating an objective that outlines a common end goal, setting up a country-specific fund particularly for targeted firms (the demand side intervention) to hire or provide internships to targeted youth (the supply side intervention), designing mutually reinforcing activities and integration-supporting incentives for youth or enterprise beneficiaries. S4YE’s new integrated framework is by no means exhaustive, but it provides tools which continue to evolve to incorporate new knowledge and adapt to new situations. Upon testing, the framework aims to help youth employment programmes address, comprehensively, the specific needs and constraints of young job seekers and firms alike, thereby strengthening their impact. The coalition’s vision of a world where all young people are engaged in productive work remains daunting, but its learnings are making its mission’s path clearer every day.